Hello. Thanks for visiting my website, Breville 800 JEXL. I know you will find a lot of good information here. Let me start with some basics about juicing. When you first start juicing, you may not be use to the taste of some raw vegetables so some juicing recipes may seem a little strange to your taste buds. Some may even seem either bland or bitter. The way to acclimate yourself to the taste – and get the highest benefit from the raw juices – is to add a fruit to any recipe that may see heavy on the vegetables. I usually will add an apple for a couple of reasons. Apples are very juicy so you will get a lot of juice with even one apple. Plus, if you buy sweet apples, the apple juice will tone down the heavier vegetable taste and will make the juice sweeter and you will enjoy it more. I really enjoy juicing and I love to mix all kinds of vegetables and fruits in my personal juices. Usually whatever is in my fridge goes into my recipes. However, whenever I am out at a restaurant that offers raw juices, I pick specific ones that have beets, spinach and carrots in the ingredients because I do not like beets and the only way I can get the benefit from them, is to have them juiced for me. Also, they tend to stain easily so I don’t want to juice them at home. I decided to add some great juicing recipes that I came across on other websites while I was surfing on the internet. A couple of them are standard juices that I’ve been using for years, but I found some new ones and they are really good so I thought I’d share them here since you are looking at purchasing the Breville 800JEXL Juice Fountain Elite. Always wash your vegetables before juicing. You don’t want to consume any chemicals or germs that may still be on the produce. You can buy a fruit and vegetable cleaner at most stores, but if you read the ingredients they are mostly water and some have the same chemicals you are trying to avoid. Besides, why not just buy two ingredients that are very cheap to buy and easy to store. You add the water at home instead of paying for it in the store. Here is my simple cleaner that I read about over 20 years ago and still use today. For every gallon of water, add ¼ cup of apple cider vinegar and ½ teaspoon of hydrogen peroxide. This is great for washing a large amount of produce at one time in your sink in large bowl. Let the produce sit for only 2 minutes, then rinse at least twice with water. However, if I just want to clean a single fruit or vegetable, I have a small 2-cup spray bottle under my sink that is filled with a combination of these same ingredients on a small scale. I just pull out this little bottle and spray my produce then rinse it with water. Here are just a few recipes that I highly recommend. I hope you enjoy trying them all. May I offer one word of caution about fruit juicing, though? Pure fruit alone can raise your blood glucose level, whereas vegetables do not have that effect (except carrots and beets). So be sure that you choose your juice so that you get a good balance or mix of both fruits and vegetables, or limit the amount of fruit juicing you do on a daily basis. - Note: because carrots stain easily too, be sure you rinse your juicer immediately after making this juice. Well, I hope you will enjoy these juicing recipes as much as I enjoy them. And, remember, there is no set way to mix fruits and vegetables. Be Creative! Make your own unique blend based on whatever ingredients are in your refrigerator. The goal is HEALTH. That is why you are juicing. 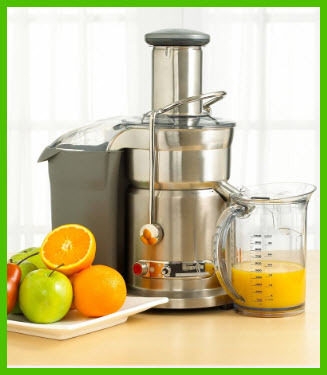 And please be sure you take a look at the Breville 800 JEXL Juice Fountain Elite as it is one of the most highly rated juicers on the market. The price is definitely within reach for most anyone interested in buying a good quality juicer. Thanks, and have a great life.